What are you excited about for your upcoming course? Assisting people to get out of stagnation and into flow, well-being, greater strength. Holding space at kundalini house with this course is bound to be a powerful transformative experience. What will students learn and take-away? Every week will be different and there will be modifications that students can take home. The course caters for all levels of practice and we will break down postures and focus on creating greater mobility and core strength. Students will learn modifications and skills they can take into their practice in and out of the mat. What inspired you to do the course? I love the concept of the changing seasons and how we can use our practice to adapt that into our bodies so we are ready to step into spring with greater clarity. I felt inspired and grateful for the opportunity as I want to create more flow and sequences which will enable students to leave the studio feeling empowered. Do you have tips for keeping us committed to the practice? Practice and all is coming. Imagine how much better you will feel once you have committed to this practice for you and set the time aside on your day to follow this 8 week journey. The benefits will be tremendous. This course is important for various reasons: the concept behind implies that if we have a strong centre the heart can open; if the heart opens it can move mountains. 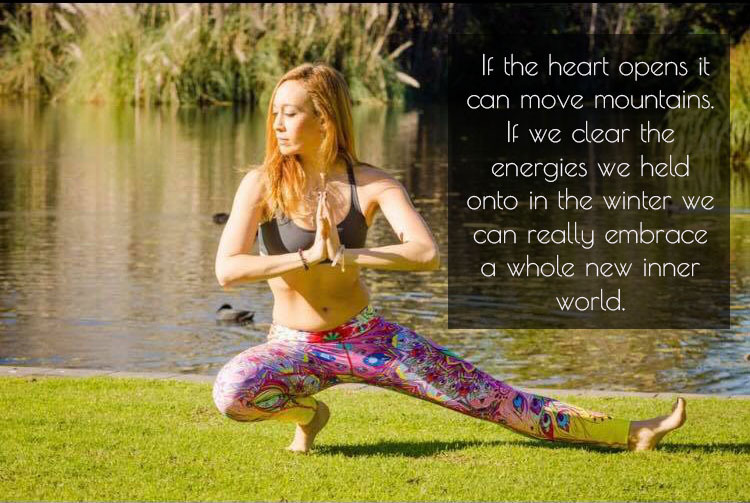 If we clear the energies we held onto in the winter we can really embrace a whole new inner world.